Submissions are due no later than April 15, 2019 and awards will be announced before the end of May. Please be sure to adhere to the submission guidelines, and submit your piece through the online submission form on this site. First-round submission reviews will be done by a panel representing faculty, students and staff. 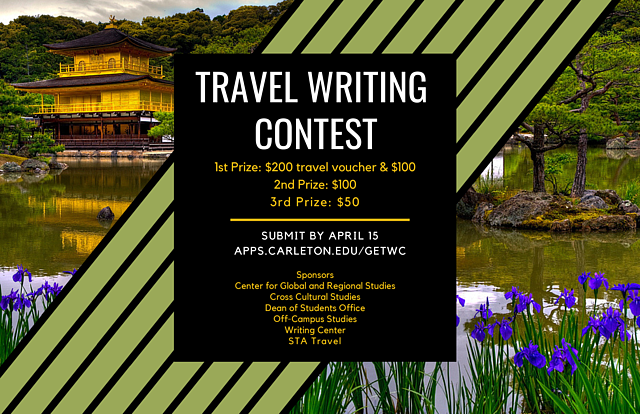 Finalists will be judged by a professional writer with a Carleton connection. View the submission guidelines and submit your entry by April 15, 2019. Questions? Contact Renata Fitzpatrick (rfitzpatrick@carleton.edu) or Annie Larson (alarson@carleton.edu).